I’m happy to announce the Early Access release of The Desert’s Rose! You can check it out here or on the Steam store page. VR Grabbing template for Unreal Engine 4. I’ve been working on a game called WhackVR and I figured I could abstract out the grabbing functionality I have into a plugin/template. Doing so allows others to use the grabbing functionality for their own game! This is important because currently there is one major way to grab things in VR and that is with the PhysicsHandle. The PhysicsHandle unfortunately for grabbing does not feel natural and lags behind. With my template however, I managed to disable physics when grabbing but still enable collision. This allows the grab to feel more natural, not lag behind, and feel more fun. Here is a video to better illustrate what I mean, you can find the template here! Comments Off on VR Grabbing template for Unreal Engine 4. WhackVR is the new name for Smash. I’m happy to announce that PanoramicVR is now available and ready for download! PanoramicVR is an application for The Oculus Rift (and other HMDs) that allows the user to view 180, 270, 360 degree panoramic images and photospheres in Virtual Reality. The SamsungVR and GoogleCardbord have something similar but you cannot view 180 or 270 panoramic images with it. The Oculus Rift, SteamVR/Vive, and other HMDs for the computer currently don’t have an application that does this, so I decided to create one :D. This is the first step to a series of applications that will be built on top of PanoramicVR so stay tuned, there’s more to come! Comments Off on PanoramicVR Release! Binary Search of an Array. Breadth First and Depth First search on a tree. Counting the number of occurrences in an array. (Example of hashing). Finding the longest “run” of consecutive numbers in an array. I just released a program for Android phones on the Google Play store. It’s called AwayReply, It allows you to set a custom message and when enabled, it automatically will send that message to anyone that texts you. The app is free and its still in early beta so if you have any problems feel free to email me (eddieohagan@optonline.net). So It was a Friday night and I was like “What do people do for fun on Friday nights?” so I decided to make a program of-course. I wanted to be able to ask the question “Who was that guy/gal that was in (movie A) and (movie B)?” so for example you want to know all the people that were in both The Matrix and Burn Notice, it would return the list of all the actors that were in both movies/shows. Here is a link to the application. Essentially what the program does is it sends HTTP get requests to IMDb pages. Then I get the IMDb pages for both movies and parse out all the actors/actresses in both movies. Then I compare all those actors/actresses and display only the ones in both. The source code is available on the Source Code page under Who is that Actor. So I found a tutorial on scratchapixel.com about how to make a simple ray tracer. Using the tutorial I cleaned up a lot of the code and made it so the user can enter custom parameters for screen dimensions and field of view. You can set the resolution (the screen dimensions) very high but at like 11,000 x 11,000 it will take up to 5 hours to generate the image (but it will look amazing). On top of that, you can also modify the items.txt file to add/remove spheres, specify their colors and other parameters. 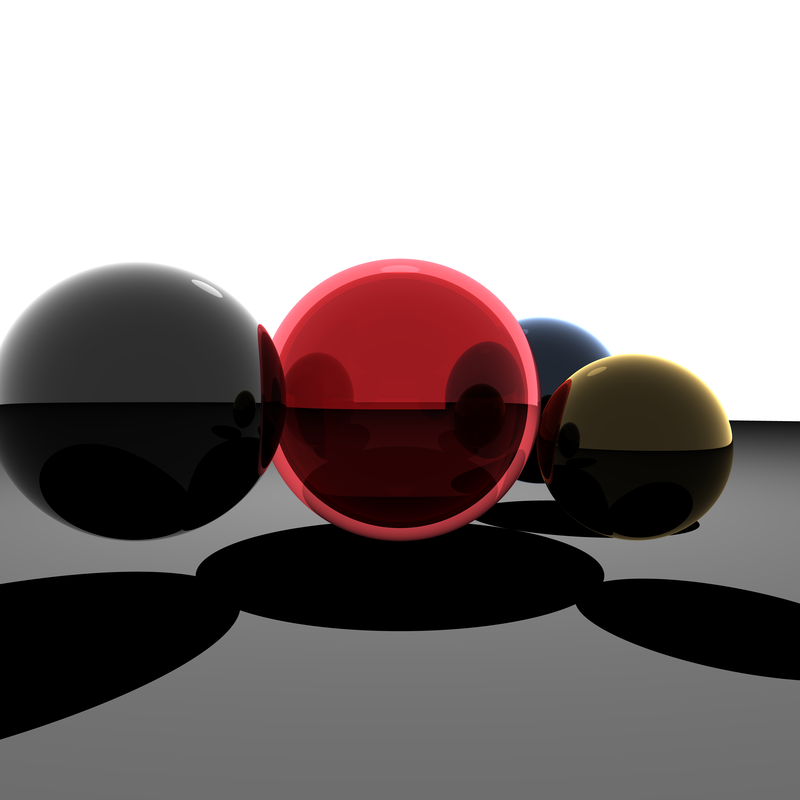 The Ray Tracer can be found in the applications page and the source code to the ray tracer is also posted in the source code page. If you want to see what came out of the ray tracer after I specified 11000×11000 with fov 60 and a high ray depth, click here. So I decided to make more video tutorials for computer science stuff. I posted the YouTube embeds on the videos page or look up Katianie9 on YouTube. Fixed small glitch with Waffle Splitter. I just discovered a small glitch with the prefix name and the tile height. The changes are up and feel free to download the latest version. Comments Off on Fixed small glitch with Waffle Splitter. Snow Samurai v1.0 is out! I just got done putting together the .exe for the Snow Samurai game. Its still a work in progress but Here it is anyway! Comments Off on Snow Samurai v1.0 is out! So I was reading up on XNA 3D Programming and I created a class that makes making 3D cubes much easier (I’ll post it in source code in a bit). I’ll also put up the main class along with it so you can see how its used (Note: if you look at the source code to Riemer’s XNA book you’ll see i got most of it from there). The Tank game isn’t going to happen :(. I was able to make it so the tanks would lie flush on the curve along with correct(or as close as i could possibly make it) positioning of the cannon. The problem is with the explosions, there’s a lot of back and fourth with the set and get data methods which makes the game very slow and unfortunately theirs no real work around this. Comments Off on 3D Cubez! I have some things in the works atm. I’m reading up on 3D game programing and working on a 2D tank game similar to gunbound. So hopefully I can get the tank game up and running soon but it still needs a lot of work. As for the 3D programing, I hope to get a small 3D game up soon as well.